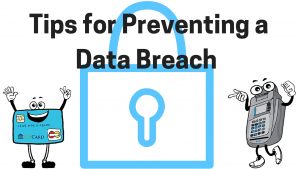 When you think about data breaches, your mind probably jumps to the highly publicized incidents of companies like Target and Home Depot. Small business might think they don’t need to take security measures–but that’s not the case. Small business are as susceptible to data breaches as large corporations, and may actually be at greater risk. Stephen Cobb, a senior security researcher at ESET, says that hackers like to target small businesses because they have more digital assets than a single customer, and not as many security measures put into place as a large enterprise. According to QSR magazine, small businesses like restaurants, are data-thief magnets because they process an abundance of credit cards and often use POS equipment. Routinely check your POS systems to make sure they haven’t been tampered with. Don’t wait for a problem to arise. Perform regular vulnerability assessments- once a week is advisable. These tests should be conducted on all systems associated with your network. Be sure adequate firewall and virus protection measures are put into place. Make sure your technology is secure and PCI compliant. Avoid combining your network with your in-store free Wi-Fi. Make sure any open Wi- Fi networks your customers may use is on a separate network from the one where you process your credit cards. If your devices are not properly installed, configured, and managed, you are taking on a large risk. Train your employees on proper security measures. Creating a culture in your business that is more security-minded can help eliminate mistakes that may lead to a data breach. If your employees are knowledgeable and diligent in regards to your network’s security, they will be better able to notice atypical behavior. Discuss with your employees the best way to optimize credit card security. Remind them that handling credit cards and physical cash is similar. There is a lot of responsibility that comes with handling money and information. Limiting how much employees handle credit cards out-of-sight can help prevent dishonest employees from stealing customer information. EMV technology in the U.S. is catching up to the rest of the world after the 2015 EMV mandate. The chip that is embedded in EMV cards is encrypted and creates a new code every time the card is used to make a purchase, making the card unable to be replicated and more secure than a simple magnetic stripe card. If a fraudulent charge has been made with an EMV enabled card, but a merchant doesn’t have the technology to process an EMV card, the merchant must accept the charge as a loss. Because of the liability shift it is critical that merchants invest in a processing system that accommodates EMV chips, whether they choose an EMV- enabled terminal or Point- of- Sale system. If you would like more information on how to update your POS system and how to be more secure, including switching to EMV compliant technology, contact us at 800-317-1819!